GREEK (HELLine, In-Hell) Alphabets . Put ALL the GreekBets into SuZar's Greek VibraLator (by just copying them from the list, dropping them in, and deleting the obsolete-bets "V 6, 9,J "). "ABGDEZHQIKLMNXOPRSTUFCYW " = 111 short vibe. Inserted 6 times, = 666 sh. Notice the other curious numbers, especially 2772. DDoubleDDeadly 77. Two7. A beast-flag number to be addressed in another section. Vibe of word CHRIST is 77. The spellings of the first six Greek letters, in ASCII, have 666s in the equation. Castrated Rem_ved Missing GreekAlphabets: Ther_ is no v_bration of "6" in Greek because the original 6th GreekBet (DiGamma or " F " composed of " two gammas") was elimnated. Interestng. The removed, dropped, obsolete, no-longer-used Greekbets are DIGAMMA, STIGMA, QOPPA (KOPPA) and SAMPI. See Greek Alphabet Chart for their appearances. 23rd GreekBet PSI is a guised Hebrew menorah... or vice versa. PSI is also a guised TRIDENT. Hmmm. We see that PSI be special. To psi (see) why, look at the next alphabet after PSI. It's OMEGA. Combining them we get PSI-O. Pun for PISO! 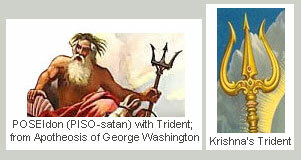 The name POSEIDON be pun for Piso-Satan. ALL these alphabets are Piso-Jinxed; Greek, "Roman" (that's ALL the alphabets written in "Roman" letters), Hebrew and Arabic --- and ASCII are one UN ited system, different faces fasces facets of one pyramided, obelisked, fat azz, fat ASCii, phat-AXed, fasces-ax beast. Reverence (Reference) books derive the Greek word JESUS from Greek IHSOUS. Greek IHSOUS vibrates to 888. SIX IHSOUS = 666 bi vibe (SH 144 + SQ 522). 5 Greek alphabets closely resemble : These TRI-angular alphabets are Alpha, Delta, Lambda, Upsilon, Psi. This Greek "ADLUY" = 59 Sequence vibe, the vibration of name PISO. ShortVibe = 19, again pun for PI in PIso (number 19 resembles IP = PI in PIso). Rearranged, ADLUY = DAUYL, pun for DEVIL. The first 3 letters only: ALP, DEL , LAM , UPS , PSI = 666 debit reverse skor vibe (RV 671 minus 5 from reduced SK 32 [3+2]). Short vibe = 59, vibe of name PISO. In ASCII "Iota, Kappa ,Omicron, Rho, Chi " = 2190 vibration, pun for 9120, aagain (numeric) pun for PISO. The first 5 letters (COPSU) punnly spell PISO twice! (PCO and PSU). And the last two, X Z are twins since X is sometimes pronounced like Z, as in Xylophone. Put the 4 chief deity names, "Allah, God, Jehovah, Brahm" of the 4 top religions (Islamity Xianity Jewdanity Hinduanity, corresponding to Arabic, RomanGreek, Hebrew) into SuZar's Roman VibraLator ... 3 times. 666 is the skor vibration (Vibe 513 + 153 skors) .